Before I went grocery shopping, I made up a salad designed to use up some stuff and free up some room in fridge. 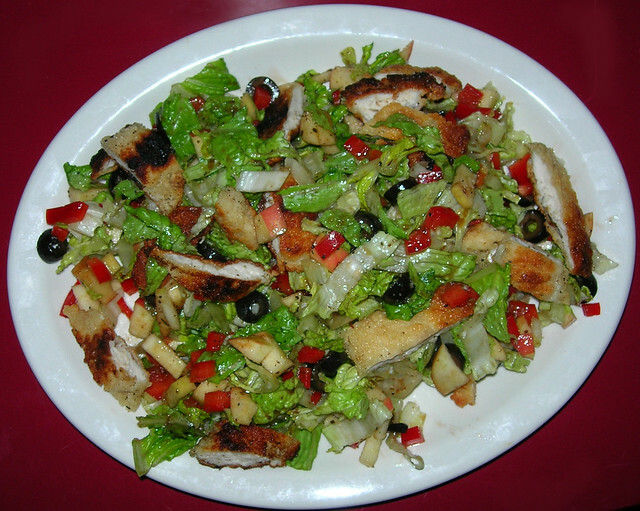 Generally you can make a salad using a pretty crazy assortment of foods if you use a classic oil and vinegar (or balsamic vinegar) dressing For this one, I use the last of the romaine, 1 Jazz apple, 5 pickled pimentos. some black olives from a can I has opened earlier in the month and thin slices of parmesan. I also had a couple chicken breasts in the freezer that were at the point where ice was beginning to form inside the freezer bag – meaning that the moisture was about to be sucked out of them rendering them dry, tasteless and not worth cooking. I thawed the breasts in the microwave and sauteed them lightly in olive oil. I made a real effort not to overcook them because being frozen, they risk being dried out already. I cored the apple and cut the slices in half. I sliced up the pickled pimentos. I tossed everything together in a pie plate, added some salt and pepper, some balsamic and olive oil and enjoyed a tasty salad. The pickled peppers add such a sweet and tart bite, that any salad featuring them feels special. I ended up with a huge salad, but I was super hungry, so it ended up being a single serving, though most times, it would be two. This is ridiculously easy and tasty vegetable dish that you can whip up in less than 10 minutes. I sliced off two 1/4 slices from a yellow onion and diced them up. In my large, shallow fry pan, I added 1 TBSP of olive oil and turned the heat to medium low (about 4 of 10 on my electric dial), added some salt and pepper and let the onions soften. Meanwhile I took 8 brussels sprouts and sliced them up to give me about 2 cups of shredded brussels sprouts. When the onions were soft and tender, I tossed the sprouts in the onions and olive oil and added a couple splashes of balsamic vinegar. Tossing it altogether lightly, I removed the from the heat when the veggies were warm, but still firm. I had some fresh dill, so I chopped up some fresh dill and tossed on top, but that’s completely optional. There’s a lovely bit of crunch remaining and the combination of onion, olive oil and balsamic is always a winner. Roast Tenderloin of Beef is one of those treats that are too expensive to enjoy very often. When you decide to splurge on roast tenderloin, it is worth your time to make sure you make it perfectly. This was a 2 pound roast. The butcher at New Seasons had already wrapped and tied the roast so that it had uniform thickness, but if your roast is not prepared by the butcher, mainly your task is to tie the pieces of tenderloin together so you have a uniform roast from end to end and no skinny tail to overcook at the end. Generally you take two pieces that go from thick to thin and lay them on top of each other in opposite directions and tie them together, folding that last bit at the end under and tucking it in so it all roasts uniformly. I prepped the roast the night before. To coat the tenderloin, I followed these steps. Second, I mixed the following ingredients together and rubbed it into the surface of the roast. Baking soda is one of the clever things that makes meat a bit sticky and tacky. A teaspoon of baking soda in meatballs will make them hold together magically. I rubbed this in until the surface of the meat was feeling just a bit tacky, perfect for helping the peppercorns to stick. Third, I mixed my cracked and cooked peppercorns with some fresh ground nutmeg and olive oil and worked it into the surface on the top and sides of the roast. Coating the roast evenly, I wrapped it tightly with waxed paper and let it rest overnight in the fridge. About an hour and a half before serving, more or less. I preheated the oven to 300° F and laid the roast on a bed of root vegetables. You can cook the roast in its own pan on a wire rack if you wish to collect the juices for gravy, but I had no plans to make gravy or any other sauce with the juice and just let it flavor my veggies. If you roast it with veggies, the veggies will take longer to cook, but you can remove the roast and let it rest while the veggies finish. Roast at 300 until its internal temperature is 120° to 125° F, depending on your preference for rare or medium rare. Allow to rest for at least 20 minutes before carving. It takes about 40 to 50 minutes to cook. You don’t want a higher heat, because you want to cook through without drying it out. This makes a tender, juicy and flavorful roast. The nutmeg adds the perfect complement to the meat and peppers and should not be forgotten. You can serve with a lemon wedge for those who want to add a dash of tangy zest. 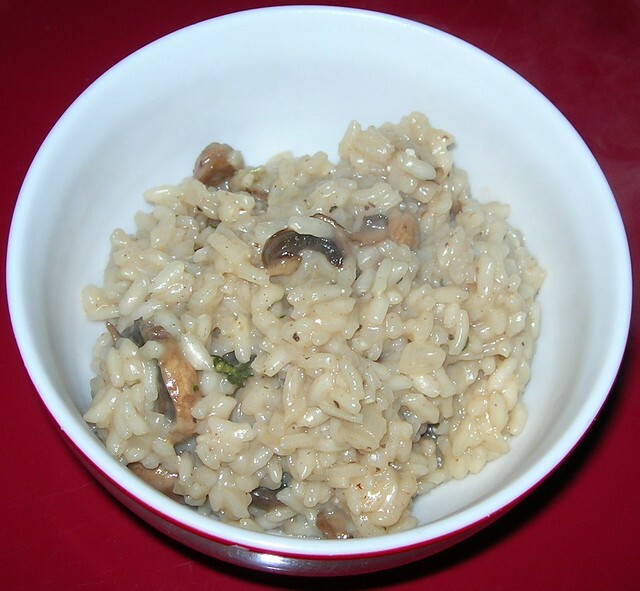 This risotto was made with beef broth, but can be made with chicken or vegetable broth as well. I just happened to have made a beef roast a few days ago. I hate to waste any food, so I saved the dripping and exudate and added the bones when the roast was consumed and tossed them in a skillet with water, salt and pepper and let boil until I got a rich, brown broth. I ended up with about 5 1/2 cups of broth which was perfect for risotto. I strained the broth and put it in a covered saucepan and set that on the stove on simmer. I cut up about two cups of mushrooms. 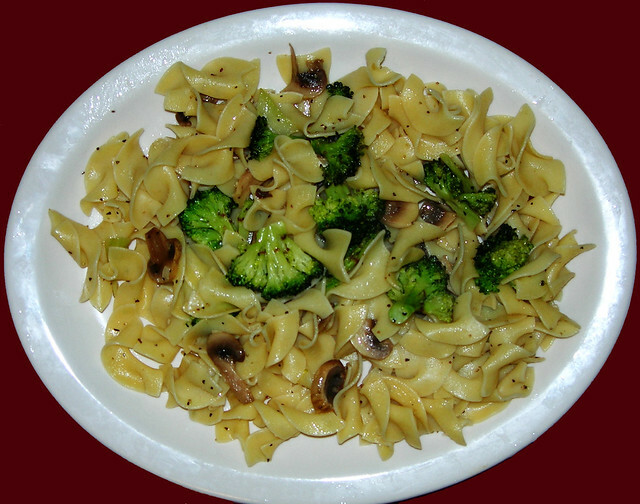 I used plain button mushrooms, but you can use just about any mushrooms you like. I cut them into slices and in a heavy pan, I tossed them in without oil or water and let them cook dry for about 4 minutes or so. This potentiates their flavor in a way that you cannot get with mushrooms cooked in water or oil from the beginning and is a great trick to make really rich mushroom dishes. Then I added 2 TBSP of butter, 1/3 cup of chopped onions and 1 TBSP of fresh chopped thyme and let saute until the onions were transparent. Next I added 2/3 cups of white wine and let it cook down by half – stirring it in well with the mushrooms and onions. After a minute or two, when it had cooked down, I added 1 3/4 cups of Arborio rice, stirring it in well and lightly toasting it before adding 1/2 cup of the simmering broth and stirring and stirring. This began the 25 minutes of stirring the rice fairly constantly while slowly adding another 1/2 cup of broth as the rice absorbs the fluid, adding more broth, stirring and adding more broth. You will make a mess of it if you add all your fluid at once, so just be patient. While you are stirring and adding broth, you should take a brick of parmesan asiago and shred about 1/3 to 1/2 cup of cheese to add at the end. After you have added your 5 1/2 to 6 cups of broth, your rice may not be al dente yet. Resist the temptation to add more water, though, because you do not want mushy risotto. Instead, go ahead and stir in your parmesan cheese, mixing it thoroughly and then put a cover on your pan, taking it off the heat and letting it rest for 5 minutes or so. It will finish cooking and absorbing all the fluid and flavors and result in the rich, flavorful ad dente risotto you want. This is not one serving – it makes six. Frankly, if I am going to make something that requires this much stirring, it’s going to last for a few meals. 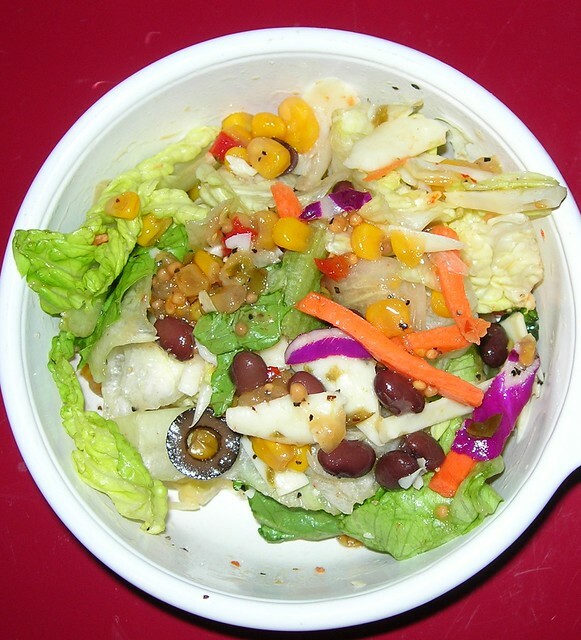 This is a quick, easy salad recipe that takes about 6 minutes form start to finish. Put a handful of almonds in a dry skillet on medium high to toast. I used a little less than 1/4 cup. You can finely chop or slice 6 brussels sprouts. This time I used a mandoline, but you get good results cutting with a knife, too. I have used both methods and the results are similar. Grate about 1/2 ounce of parmesan cheese. Mix into the brussels sprouts. Mix up a quick vinaigrette with 1 tsp mustard, 1 TBSP cider vinegar and 2 TBSP olive oil. Blend and dress the salad. Add some salt and pepper. The almonds should be nicely toasted. Chop them up and toss into the salad and there you have it. 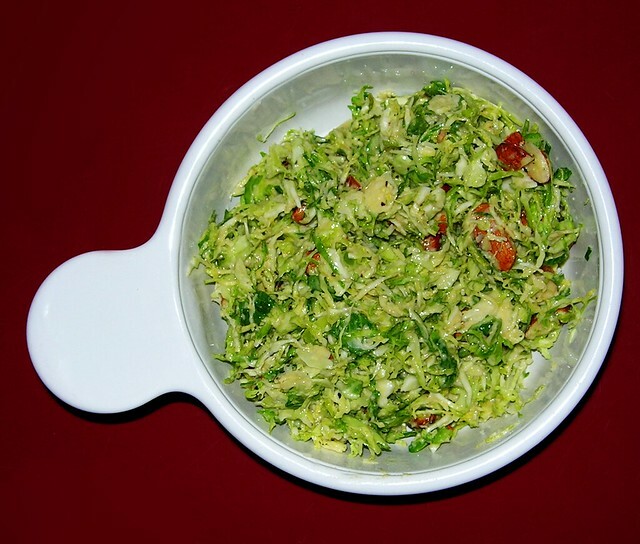 The cheese gives it a nice earthiness blending with the fresh bite of the brussels sprouts, the tang of the vinaigrette and the smoky nuttiness of the almonds. It’s delicious. I love the Bravo TV competition show Top Chef. The chefs I root for never win, but that’s okay. I kind of know they will not win early in the season. This season of Top Chef, I was rooting for Carla Pellegrino who sadly has been eliminated all too soon. I loved her joie d’vivre and lively exuberance. She has more energy and enthusiasm in her little finger than the next 10 people put together. As so often happens on Top Chef, one week she was on top, winning with a carrot soup recipe, and the next she was gone. I was curious about Carla’s carrot soup because the judges raved about it and awarded it first place. I could not quite imagine how it could be that good. First off, I will just put it out there that I am not that fond of cooked carrots. I think they are too sweet and I generally prefer them raw. I wondered how it was possible her soup was not too sweet and decided I had to try my hand at it just in case the judges were smoking something. I found the recipe online and of course, it makes enough for an army. I also didn’t have all the ingredients and was not going to run to the store to get them, so a little experimenting was needed. So, the first thing to do was start the soup. Carrots are tough, fibrous and dense vegetables that need lots of cooking time, so the soup will has be well on its way before I start the meatballs. I turned the heat on my sauce pan to med-low (a 3 on my 1 to 10 dial) and added 1 tbsp of butter. While it melted, I chopped up on yellow onion and tossed it in with the butter. With heat that low, the onions will not brown. Instead they will almost melt away as you sweat them on this low heat. Add some salt and pepper, but use a light hand. Carla also used leeks which add a bit of a mellower flavor and a lot more depth, but I didn’t have any. This will work anyway. While the onions sweated, I made up a little bouquet garni (a cloth pouch of herbs used so you don’t have to strain them out to keep their greeny goodness from messing with your orange carroty brightness). In the cloth pouch, I put in 1 bay leaf, 1 twig of fresh thyme, 2 tsp of dried parsley and 2 tsp of dried oregano. I also added 2 peppercorns. Now Carla did not add oregano, but I was suspicious of the sweetness of the carrots and wanted the oregano to cut that sweetness a little more than I thought her herb choices would. I tossed the bouquet garni in, making sure it was in the liquid and let it continue to sweat away for about 20 minutes in all. Meanwhile, I chopped up my carrots into fairly uniform pieces so they cooked evenly and let them sweat for 20 minutes with the onions. Although they remained quite firm and nowhere near done, I could see a bit of the fluid sweating out, mixing with the onions and butter. I also started drooling from the heavenly aroma from the onions and garni. Once the carrots began to soften, I added enough water to cover the carrots by about an inch. I turned the heat up to a simmer (5) and once it was simmering, I put on the lid and let it simmer away, just checking occasionally to see how done the carrots were getting. It will take 30 minutes to cook the carrots to tenderness. I turned my oven to 375°F and let it heat up. I took 12 ounces of ground turkey, 2 cloves of minced garlic (more than Carla used), about 1/c cup of dried parsley, a/4 cup shredded parmesan and mixed in a bowl with one egg. I then began crushing saltine crackers (Carla used bread crumbs, but I didn’t have any and my mom often used saltines in her meatballs.) I kept adding crackers until the meatball held together without being too eggy. I turn a burner on to medium and put about 1 TBSP of butter in my iron skillet. Using an ice cream scoop to make the uniform in size, I scooped the meatballs into the pan and let them brown on one side before turning to brown on the other. Once they browned nicely, I slipped them in the oven to finish cooking. (About 20 minutes.) This made 12 meatballs. While the meatballs cooked, I took two stems of kale and stripped the leaves off the stem. I sprinkled some olive oil and kosher salt on the kale and, using my hands, lightly worked the oil and salt into the leaves. I set it aside to bake once the meatballs were done. Once the meatballs were done, I turned the heat down to 275 and put the kale in to bake. After 10 minutes I turned the kale over. Once the kale was baking, the carrot soup was tender. I poured it into my Magic Bullet and pureed it thoroughly, making sure there were no chunks left. You can use an immersion blender, blender of food processor. Now everything is done, it was time to put it together. I ladled some soup into my bowl, placed 3 meatballs to one side and garnished with the kale chips. Carla made an parsley salad with chopped parsley, olive oil and lemon juice, but I wanted the bitter crunch of roasted kale. The saltines and the roasted kale all add salt to this dish, so when salting on each step of cooking, use a light hand. So, now it came time to taste the soup. It was magnificent. I am thinking of making it for Christmas dinner. It’s beautiful to look at, kind of foolproof in putting together and the oregano and kale balance with sweetness of the carrots so perfectly. It was so tasty, I called my best friend and told her to come sample my soup soon because it would not last long. This made 4 servings – which is about as small a batch as you can make using one egg for the meatballs. 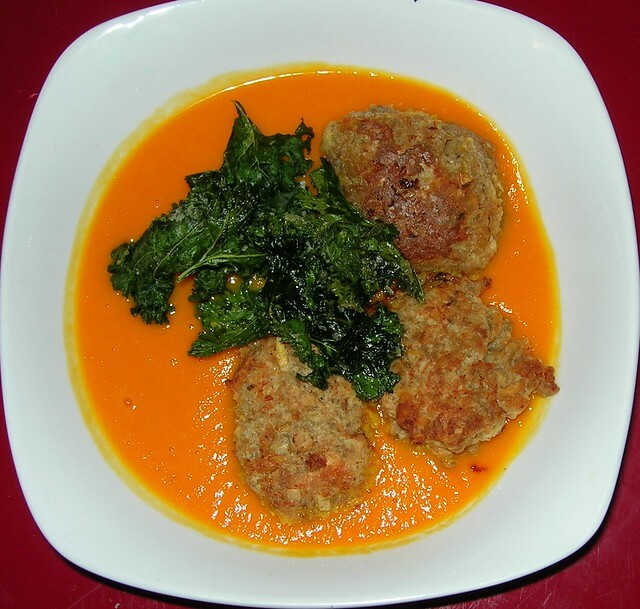 I can imagine vegetarians might like it without the meatballs and a bit of carrot soup and kale chips is a satisfying mouthful. I would not recommend using olive oil instead of the butter. Part of the richness in flavor comes from that butter. I found the same thing to be true of celeriac soup, with olive oil it is good. With butter, it is delicious.